Aging doesn't take much effort—all you have to do is breathe. Aging faithfully is different. It requires intentional effort to stay focused on God as you make your way through a world of chaos and change. Many women dread aging and resist thinking about it. Yet God designed the human body to change over time, and growing older is part of God's plan. How we handle the changes that accompany aging reveals much about our spiritual maturity. Beach Calling takes a fresh approach to aging. Missy Buchanan uses comforting imagery from the beach and ocean to engage readers in spiritual reflection. 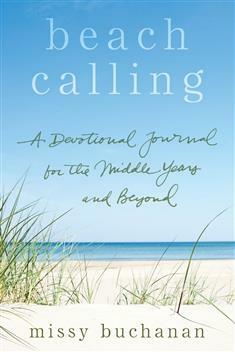 In this devotional journal for women in their middle years and beyond, she guides readers to explore and embrace God's plan for growing older. Each devotion focuses on a familiar aspect of beach life and leads the reader to a parallel lesson on aging. Each reading contains journaling prompts that invite readers to capture their thoughts in the journaling space provided. Beach Calling helps women accept and prepare for life transitions, including how to navigate the challenges of loss and decline. This inspiring resource leads readers to discover the hope and joy that faithful aging can bring.